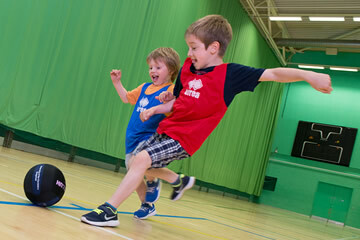 Choose from a range of fantastic birthday parties to celebrate your kids special day at Hertfordshire Sports Village and make it a birthday to remember. Kids Village is centrally located in Hatfield, minutes from Welwyn Garden City and St Albans, with plenty of parking on site for your party guests. 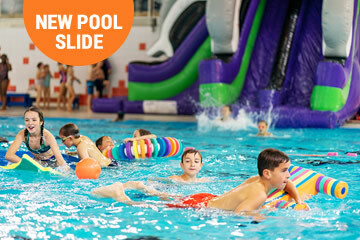 Make a splash with your friends at our pool party with NEW inflatable pool slide and inflatables galore! 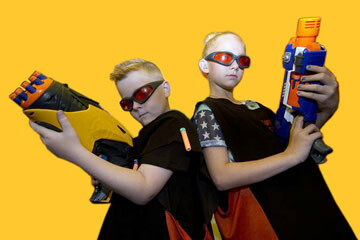 *17:15 party slot – activity only (£275 for up to 40 children). Food area is subject to availability for this later party slot and additional cost applies for food area. Brand new party to test your shooting skills in an epic battle with your friends. Pick your favourite sport and get your friends together to make it a party to remember. Choose a sport and battle it out to find the winning team! 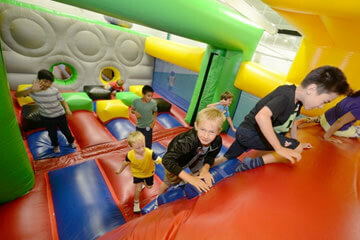 Jump around and take on our 27m bouncy castle assault course with your friends! There will even be an array of soft play equipment for the youngest of party goers! Float and splash with your friends in our shallow pool – suitable for little ones who are less confident in the water. Get the gang together for dance training from one of our experienced teachers. The group will enjoy dance-related games, learn a cheer or street dance routine with pom-poms and an exciting routine will be performed at the end of the party! All prices above include a designated party food area for your booking to have your food, cut the cake and sing happy birthday. The food area is in our Refectory which is adjacent to our building. You will have access to this from the start of your party and for 1 hour, 15 minutes after your party. *Not including the 17:15 Pool Slide Party slot. Food area subject to availability and for an extra cost. 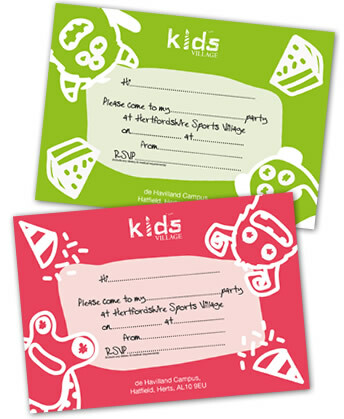 Pizza Hut Hatfield have teamed up with Hertfordshire Sports Village and are now offering exclusive offers to all party bookers who book a party room with us. Book your party activity and party food room and get exclusive codes to receive fantastic deals. 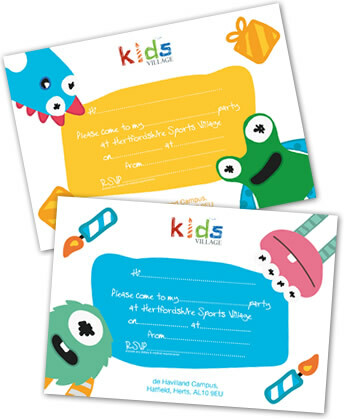 Select your perfect invites from our choice of colourful monster themed options.